Hello Welcome to Body Moments Special October Sale Issue! Autumn is a wonderful time to take a fresh look at yourself and your energy levels. Taking some time to do some yogic energy work with your body is often very therapeutic because not only does it balance your physical body, it also clears your heart and soul. Chakra work, as it is known, will rejuvenate you and get you ready for the long, long winter ahead. Now, as a special gift to my subscribers and readers of my newsletter, I am offering a greatly reduced fall special on my Chakra Healing Meditations. These meditations use yoga postures and breathing techniques to help you clear and balance your chakras, or simply put, your body's energy systems. If you read my website, you may know that this package of seven chakra meditations is normally priced at 34.95 USD. I am now offering them for another 15% reduction from the package price. If you were to purchase each chakra meditation separately, it would cost you 6.99 each for a total of 48.93. The mere price of 29.99 represents a cost savings of almost 40%! You cannot afford not to purchase this health-boosting package. The seven meditations represent over 100 minutes of therapeutic yoga meditations, as well as a PDF file for each meditation explaining the target energy area, full instructions for the movements as well as suggested affirmations for improving the health of each energy area. This is a digital-only product, available for your immediate download, anywhere in the world! If you are unfamiliar with energy systems of the body, you may go to this page to learn more: Chakra Yoga. However, make sure you come back to this newsletter to make your purchase, to get the subscriber sale price! *Paypal automatically converts your country's currency to USD and YOU never pay a fee! Welcome, new subscribers! If you have not subscribed, but had this email forwarded to you from a friend, please consider signing up yourself, by going to Body Window Newsletter. I never, ever send spam. By subscribing, you will receive a free heart-opening meditation as a gift from me. You may also be interested in joining the Body Window Facebook community. We'd love to have you join us! If you want to regularly view uplifting teachings on mindfulness, healing, yoga and motivation please join us there too! We must all find ways to stay healthy and whole, in our bodies, minds and souls! If you are into Pinterest, I have many boards there, at Pinterest/Body Window. Check out all my yoga poses, foam rolling suggestions, inspirational photos with quotes, and much, much more! Please consider following my boards! In September, I took two weeks off from my normal life, and walked the Camino de Santiago, a pilgrimage to Santiago de Compostela in the north of Spain. I also began a new website, the Pilgrimage Traveler, to document my experiences and to assist others in learning how to travel as a pilgrim. Please follow my exciting new website, as I post of my Camino Inglés, and my Camino to the End of the World. (You may also wish to see my Facebook reflections at my Body Window Facebook page as well). I have just two new articles since I last published this newsletter. One is a modified hip opener, for those with tight hips and the other a very fun, yet very therapeutic one! 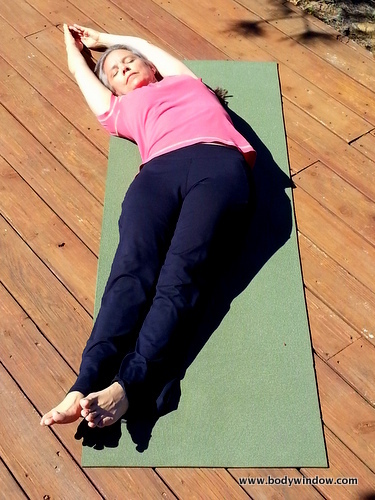 If you are new to the therapeutic effects of long-held poses in the yin practice, please visit my article for more explanation at What is Yin Yoga? The Half-Shoelace Pose is a therapeutic modification of the Shoelace Pose if you have tight hips, but still incredibly therapeutic! The Bananasana or the Banana Pose is a fun way to open your entire side-body, from the top of your ribs to your iliotibial bands. If you or someone you love are in pain and wish to seek guidance on how your beliefs may be contributing, my holistic health coaching services are here for you. I have the unique ability to help you interpret your own Body Window messages. I am an experienced Registered Nurse as well as a Registered Yoga Teacher, so I can be of great assistance in your healing process through the integration of both Western medicine and holistic, body-mind techniques. Often the reason for your pain is spiritual as well, and I am an ongoing student of the spiritual pathway through many disciplines and can offer direction there too. If your heart is calling you to fix your broken body-mind-soul, please contact me at your convenience. I am here to help you understand if I am the right fit for your needs. Are you ready to start your healing journey today? To see all my back issue newsletters, click on the link, Body Moments, Back Issues.